How to create a lwIP project, which is an open source TCP/IP for small systems, using the Kinetis SDK and FreeRTOS on the FRDM-K64F board. lwIP is a small Open Source TCP/IP implementation suitable for small systems. The project can be found on http://savannah.nongnu.org/projects/lwip/. The Kinetis SDK comes with an lwIP port which I’m going to use in this project. The goal is to create a project with lwIP and FreeRTOS running on the FRDM-K64F board. Freescale Kinetis Design Studio (KDS) V3.0.0. Alternatively stock Eclipse with Processor Expert installed (see “Going to Mars: Building a DIY Eclipse IDE for ARM Embedded Microcontrollers“) can be used. 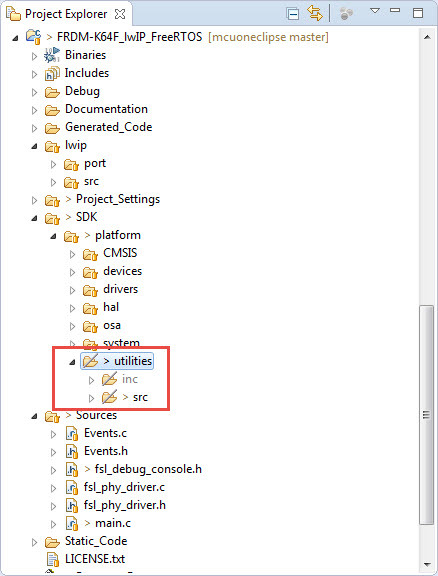 In KDS, use the menu File > New > Kinetis Project to create a new project. Then finish, and the proejct is created. :! : Important: without the above settings the ENET will not properly work! This adds the component to the project. It’s settings can be at the default settings. Next, FreeRTOS gets added. I’m *not* using the FreeRTOS component which comes with the Kinetis SDK V1.3.0 as it is an older version and does not support advanced features like RTT Tracing (see “ Search Using Segger Real Time Terminal (RTT) with Eclipse“). I would like to use semihosting (see “Semihosting for Kinetis Design Studio V3.0.0 and GNU ARM Embedded (launchpad)“) to write messages to the debugger console instead of using a physical UART. * Map printf for semihosting implementation. I can copy-paste paths settings to the dialog in Eclipse. After that, the RTOS gets started with vTaskStartScheduler(). Welcome to the world of lwip! LwipInitTask: lwip init called ..
A long-time-waiting thing on my to-do list finally has been accomplished: It takes many pieces to build the basis of a network IP application, and lwip for sure is a good and well documented open source project. With the help of Processor Expert many aspects of the networking application get simplified, and after some tweaks the Kinetis SDK is now working too. The project created in this tutorial is on GitHub: https://github.com/ErichStyger/mcuoneclipse/tree/master/Examples/KDS/FRDM-K64F120M/FRDM-K64F_lwIP_FreeRTOS.